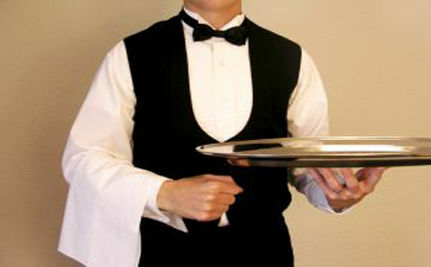 A typical restaurant employee cross-contaminates food with pathogens (disease-producing agent) once per hour. They do it by wiping their hands on their aprons and by using the same utensils and surfaces for both raw and cooked foods. Compliance with hand-washing guidelines decreases when kitchens hit peak hours. Researchers at North Carolina State University performed a study using video cameras in restaurant kitchens to see exactly how employees follow food safety regulations. Eight restaurant kitchens volunteered to participate in the study, and each kitchen was equipped with as many as eight cameras. Errors such as using a knife to cut raw chicken, then using the same knife to slice a sandwich, or dripping raw meat into vegetables used in salad, occurred more frequently than researchers expected. Such practices are in violation of the U.S. Food and Drug Administration Food Code inspection guidelines and can lead to outbreaks of foodborne illnesses. Researchers noted that the restaurants participating in the study reflected the best industry practices for training staff. The U.S. Centers for Disease Control and Prevention says that there are an estimated 76 million cases of foodborne diseases such as E. coli and salmonella each year in the U.S. Most of those cases are fairly mild, with symptoms generally including diarrhea, abdominal cramps, dehydration, and nausea. More serious cases require hospitalization and number approximately 325,000 per year. Foodborne diseases are responsible for about 5,000 deaths in the U.S. every year. Cross-contamination once per hour per employee with an average sift of eight hours… that’s a lot potential for spreading illness. Seventy percent of food poisoning outbreaks come from meals prepared outside the home. It turns out that home cooking is not only more satisfying, but safer. That's pretty nauseating. Here on the farm we don't eat out. I am extremely meticulous about food handling safety in the kitchen at home, though. It's really important. I have a low immune system due to chemo, so I can get very sick from bad pathogens. It is unbelievable how food safety is so much ignored everywhere! Stomach flue is the name they call for food/bacteria born illnesses. Unfortunately raw salads are off my list of foods now and eating at restaurants could be a trip to the hospital. I don't use the mens room so I wouldn't know if they wash their hands or not.